Now almost 25 years later, Street Rods by Michael is the premier Classic Car, Muscle Car and Street Rod Builder of the South! 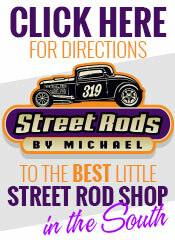 Street Rods by Michael has had the distinct honor of being chosen to build four NSRA Give-away Cars and is builder of the Goodwin Speedster, 2014 AMBR Contender (America’s Most Beautiful Roadster). He’s also been a Street Rods National “Featured Builder” for many years. Some of the other services offered at S.R.B.M are fabricating chassis, pressing louvers, chopping tops, custom painting and so much more. We also offer a complete line of products that will let you personalize your rod the way you want. Whether you build your own rod or have us build one for you, you can be assured that your rod will be assembled with the highest quality products for safety, durability, functionality and attractiveness. You are always welcome at Street Rods by Michael! Stop by 120 Deery Street, Shelbyville, TN 37160 for the “10¢ tour”!